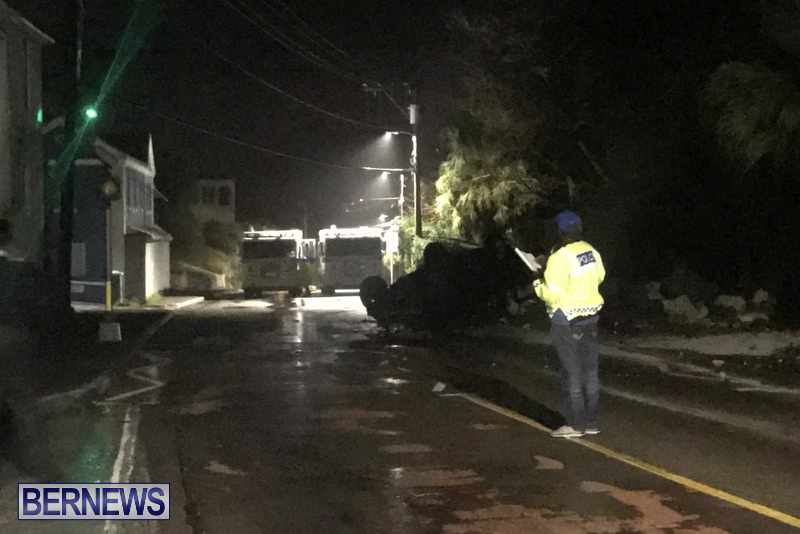 Traffic diversions are in effect in the area of Flatts Hill in Smith’s as a result of a serious car crash according to police. A police spokesperson said, “Around 10:20pm Monday, March 12th police and first responders were dispatched to a reported serious single vehicle car crash on Middle Road in Smith’s parish in the vicinity of Flatts Post Office. “Details are limited at this time. However, initial information suggests that the vehicle overturned and that as many as five people have been injured. “Traffic diversions are in effect in the area until further notice. Update 1.04am, March 13: A police spokesperson said, “Around 10:20pm Monday, March 12th police and first responders were dispatched to a reported serious single vehicle car crash on Middle Road in Smith’s parish near the junction with Clarendon Road. 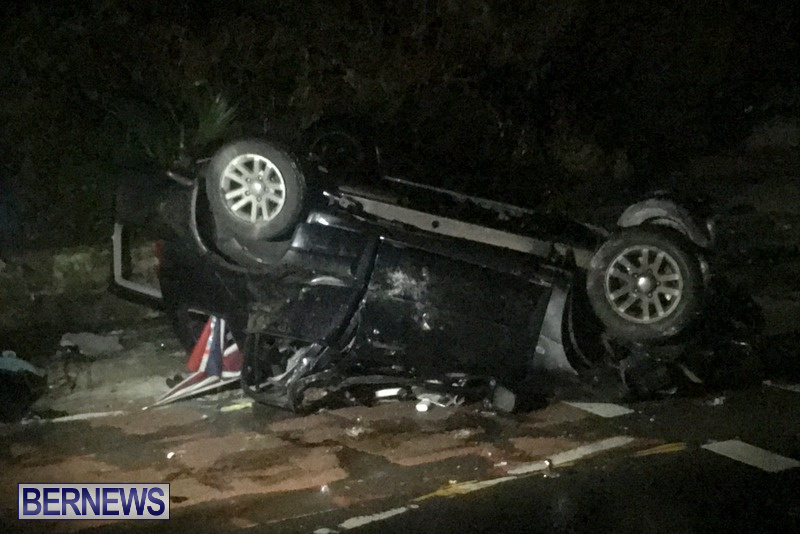 “It now appears that six people were hurt – the male driver plus five passengers [two females and three males] – when the car involved overturned in the vicinity of Flatts Post Office. “Indications are that all six individuals were transported to King Edward VII Memorial Hospital via ambulance[s] for treatment. “The full extent of their injuries is not known at this time, but an update on their conditions is anticipated in due course. “The driver, believed to be a 25 year old Warwick man, has been arrested on suspicion of impaired driving. “The vehicle, a wall and a pedestrian crossing light pole were apparently damaged in the crash. “Traffic was diverted away from the area for approximately three and a half hours while the scene was processed by the relevant police personnel. An 18 year old woman was in stable condition in the Intensive Care Unit [passenger]. An 18 year old woman was in stable condition and will be admitted to a general ward [passenger]. A 19 year old man was in stable condition and will be admitted to a general ward [passenger]. A 25 year old man was treated and discharged from hospital [passenger]. A 27 year old man was treated and discharged from hospital [passenger]. A 25 year old man was treated and discharged from hospital [driver]. 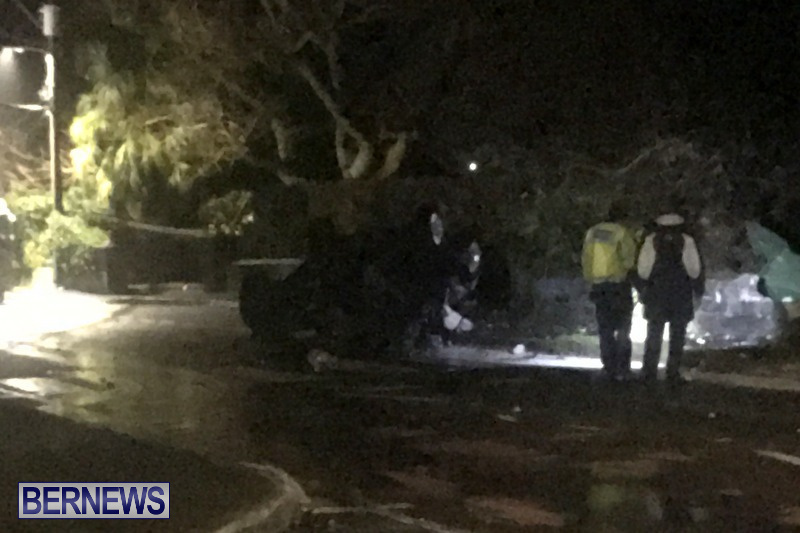 “The car involved has been impounded and the driver, said to be a 25 year old Warwick man, was arrested on suspicion of impaired driving. He remains in police custody as inquiries continue. Tell them to turn their lights down I can sleep and they are outside my house. I hope you go no sleep at all. How are you mad at the fireman who are there to save lives? Just selfish. Another one in a hurry to go nowhere!! It took speed to flip that car! Six people in that tiny car? Didn’t the driver care enough about all those lives in his hands to slow down and be careful? Especially on wet roads at night. How reckless drivers are with others’ lives. Did you see the article? It said he was arrested for suspicion of impairment. People shouldn’t be getting behind the wheel allegedly impaired and while not directly their fault, the other 5 drivers are also irresponsible for getting in the car with an impaired driver! You may well ask if owning a small car is a good investment. There are several points of view that need to be considered . There is as in every thing the “good and bad ” for example when I rent a car in the US I always go for the larger vehicle that decision is for safety reasons. This is the poor mans life insurance policy, as you have plenty of metal infront of you with the larger and heavier vehicle , that is good. You may think that you are getting a break owning a small car, if so, your are dreaming because they virtually cost just as much to service and repair as the larger vehicle, and they burn proportionaly more gas as you put you foot down further to get over the hills. Smaller tires wear out faster making the vehicle in time unsafe, what about smaller brakes ? less tire tread on the road. There is also some manufacturing cost cutting to bring the vehicle to a price bracket. Power to weight ration goes way out of balance when you stick 3 or 4 people in small cars which usually have undersized engines requiring a “T” boost. The Turbo device is nothing more than a forced air pump. The big buzz here is Turbo, Be carefull, with our slower speeds there is ” turbo lag” you have to drive the car faster to get the turbo to function properly, don’t ask about hill climbing it is not there. I wish i could say that smaller cars are space saving ,not so, you still have to keep your distancd driving them, they, likewise must do the same . I have not done the numbers, are small cars involved in more collisions ? Traffic accidents take less than 4 seconds to happen, there are over 15 thousand motor vehicles in use daily, most folks are good…when these type of accidents occur, folks ask where are the police. I would say we have a responsibility for our own individual driving habits.Hopefully the authorities will do their work in these circumstances, and may all the victims make a full recovery, and come to terms with what led up to this terrible accident. Wondering what happened?? Well, 1.SPEED 2. Alcohol. 5 persons in a car driven at high speed on wet roads on that stretch of road, loses control on the corner, at that point they were all passengers as the driver no longer had control of that vehicle. Thank God that no other vehicle was on the west bound lane. People do dumb crap behind the wheel or handlebars of a powerful motor vehicle and suddenly think they are behind the wheel of a Nascar or Moto Gp bike. Personally speaking, I don’t think that any legislation put in place will fix STUPID.